Shirts With Random Triangles: Report: Washington head coach Steve Sarkisian defects to USC. Report: Washington head coach Steve Sarkisian defects to USC. 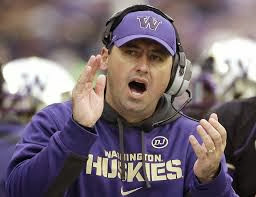 Sources tell ESPN that Washington head football coach Steve Sarkasian has accepted the head coaching job at USC. Sarkasian has led the Huskies since 2009. Has a 34-29 record over five years at Washington (24-21 in the Pac-10/Pac-12), going 8-4 this season and 5-4 in-conference. Interim USC head coach Ed Orgeron has reportedly resigned after news of Sarkasian's hire. USC athletic director Pat Haden reportedly gave Orgeron an offer to remain on the Trojan staff as an assistant head coach. The offer, which Orgeron rejected, would have made him one of the highest paid assistant coaches in college football.